This commercial real estate property script is the footstep of front-runners of real estate digitization. We feel prestigious to mention that we have tried our best to integrate the most essential features of multimillion-dollar companies like MagicBricks.com and Makaan.com. This commercial real estate listing and selling script is made affordable for aspiring entrepreneurs. 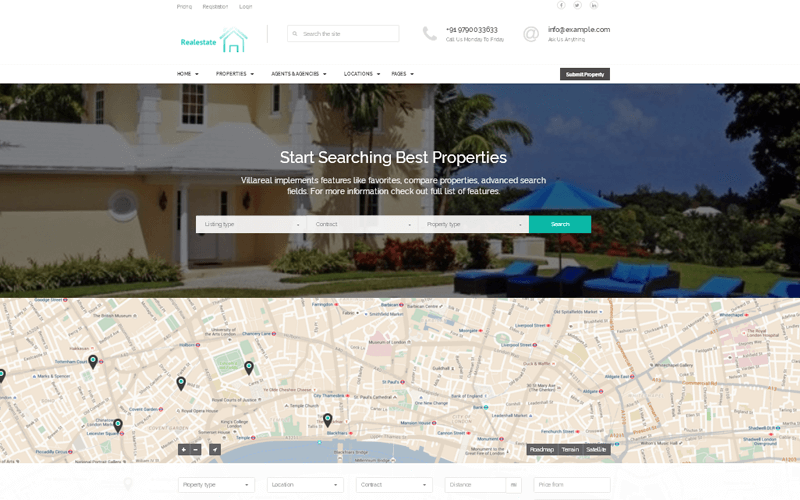 This script has multiple categories of property listing (residential, commercial properties, plots, individual houses, apartments, property resale etc.) incorporated in it, which will find their buyers at the earliest. Designed in the most user-friendly manner, this script facilitates an individual to locate the property of his/her choice, with least required search tags but with a smarter display of results. In other words, through this dynamic real estate script, you can not only review, submit, and advertise various portfolios of residential and commercial properties, also the options to extend your business to a new set of boundaries. This real estate portal script is designed with hundreds of features integrated from the pioneers of real estate websites, fulfilling your dream to create a website with excellent features. This otherwise would have been a herculean task if u have an intention to finalize this design from scratch. This script is integrated with multiple revenue models providing you with an excellent return on your investment with its revenue earning facilities of premium membership, advertisement banners, premium listing and News letter revenues. The Advanced Search system with flexible parameters can provide you and your users with the best suitable search results duly providing considerations to their amenity requirements, locations, budget etc. With the best SEO friendly design and Page Optimization integrated into the script (an after effect of our SEO expertness) search engines have no option rather than provide you with the best visibility in search results. With the support for Multiple Languages, the geographical boundaries are no more a restriction, spreading your scope for business. We keep up with all the latest standards and trends, and take active measures to update you with the latest developments. Towards this, we are providing you with 6 months of free updates after your purchase of this Real Estate Script. With the best user-friendly design; having a simple and intuitive interface, neither you nor your users will face any difficulties in locating their requirements across the pages. The Integrated Payment Gateway facilitates your premium membership management besides paving a way for better payment options. Its flexibility to provide “Dual Home Page Design” (One with Google Map Integration, and the other with Gallery Integration) is one of the key highlights of this Real Estate Script. We know that getting your website to the real estate agents and common users is necessary which is why we have made our script to be SEO-friendly by optimizing it in accordance Google standards. Very good script and very good support from PHP scripts mall. I love the script, the design is very good, The Function is very good. Love the multitude of features available! Amazing concept. Different types of websites can be created. Love it!